Thank you for your interest in Blood FlowMeter. Please complete and submit the form below and an ADInstruments representative will aim to get in touch within one working day. If you’d like to speak to someone immediately, office contact information is available from the contact page. A single-channel laser Doppler blood flowmeter used with a specialized fiber optic probe (purchased separately) to measure blood cell perfusion in the microvasculature of tissues and organs. A single-channel laser Doppler flowmeter used with a specialized fiber optic probe (purchased separately) to measure blood cell perfusion in the microvasculature of tissues and organs. The Blood FlowMeter supports invasive and or non-invasive specialist disciplines with a range of probe types and probe formats. The Doppler flow probe can also directly stream real-time recordings to LabChart acquisition and analysis software (purchased separately) via USB digital output and the Blood FlowMeter Device Enabler add-on software (supplied). Plug and play: LabChart compatibility means that the blood flowmeter is automatically identified and all relevant configuration and channel settings are preloaded. Requires no further calibration procedures or configuration, so you can have confidence your system is properly configured every time. 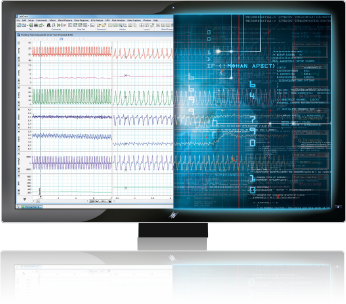 Flexibility: Either use on its own direct with LabChart, or record other signals using a PowerLab for simultaneous measurements. 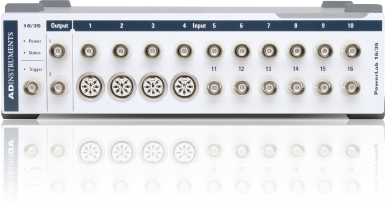 Alternatively, it has two outputs that provide analog data that can be recorded via a PowerLab data acquisition unit. Speak with your sales representative as to which connection option is best for your research.